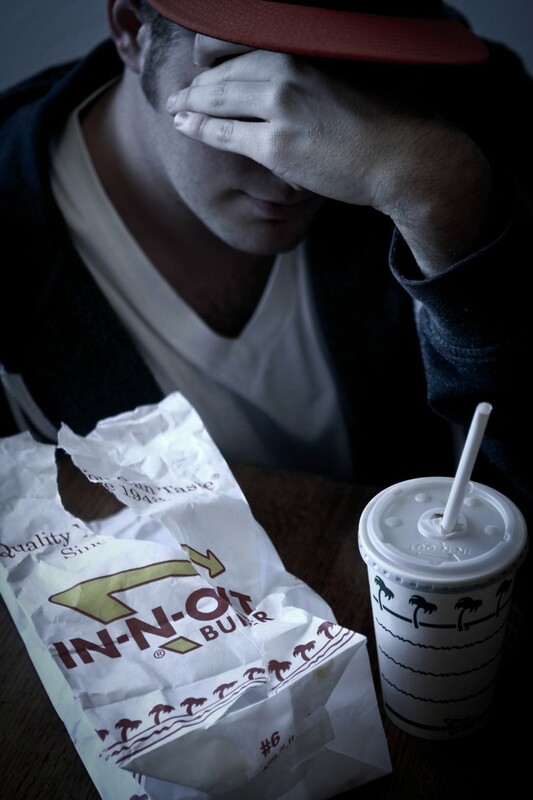 Two separate studies conducted in Spain and the United Kingdom found a link between the consumption of fast food and increased rates of depression. Trans-fat is the name given to unsaturated fat, and trans-isomer fatty acids are fatty acids that are non-essential to the human diet. Trans-isomer fatty acids are abundantly present in most fast food, and can lead to many illnesses, such as coronary heart disease, diabetes and obesity. Prior to the study, none of the 12,000 volunteers suffered from depression. But after data from the study was collected, 657 people became new sufferers. Many of those new sufferers had processed foods as a regular part of their diet. The British study, conducted by University College London, found similar results. In the study, 3,500 volunteers were split into two groups, each with a different diet assignment. One half of the participants adopted a diet of largely whole foods, such as fruit, vegetables and fish. The other half ate mainly processed food, largely consisting of processed meat and fried food. The researchers found after five years of careful monitoring that those who ate mostly whole foods were at a 26 percent lower risk of future depression than those who ate lesser amounts. In contrast, those with a diet high in saturated fats and processed foods were at a 58 percent higher risk of depression. Dr. Andrew McCulloch, chief executive of the British Mental Health Foundation, welcomed the new findings. The current number of depression sufferers in the world is around 150 million, and this number has increased in recent years. Scientists from the Spanish study have pointed to the increased popularity for mass produced fast food over the past 30 years as a reason for the surge. There is concern for those who live in areas where there are large concentrations of fast food restaurants or who are out of reach of fresh food. A 2010 report published in the Archives of General Psychiatry claimed that countries with a Mediterranean diet rich in fish, fresh vegetables and olive oil encountered lower levels of depression than other Western countries. Other foods that have been proven to be beneficial for mental wellbeing are dark chocolate and whole grain cereal. A recent study conducted by researchers in Switzerland, published in the Journal of Proteome Research, found that consuming small amounts of dark chocolate, around 1.4 ounces, can lead to lowering of the stress hormones cortisol and catecholamine in the body, which reduce feelings of anxiety.